The Yankees lost to the Tampa Bay Rays 6-1 on Thursday night at Tropicana Field, and after winning the first game of the series, they lost the next three. A major reason that they lost the last three games of the series is that they combined to score only five runs in those three losses. The Yankees didn’t do anything well offensively or defensively in the loss on Thursday. Chase Whitley was only able to pitch 1.2 innings before being taken out of the game due to elbow issues. He was likely more wild than normal because of the issue with his elbow. He threw a changeup that was nowhere near Brian McCann and went all the way to the backstop. He allowed two hits, two walks and three earned runs because the two runners that were on base when he left the game were charged to him. It seems likely that Whitley will need Tommy John surgery based on the situation. He would have been been replaced when Masahiro Tanaka returned to the rotation anyway, but this injury to Whitley will hurt the team’s depth at starter, especially since he had showed signs of improvement from last season. “It’s in that area that you don’t want to talk about,” Joe Girardi said. Esmil Rogers, who came into the game after Whitley was taken out after being looked at by the trainer, allowed a three-run homer to Rene Rivera on the first pitch that Rivera saw. Rivera came into the game with a .126 average and only five RBIs, but he was able to go 2-4 with four RBIs against the Yankees in this game. Rivera’s second hit of the night was a single up the middle to center that scored David DeJesus to make the score 5-0. Evan Longoria, who has owned the Yankees the last few years, hit a single to left to drive in Steven Souza Jr. in the seventh inning off of Chasen Shreve. Shreve has pitched well overall in his first season with the Yankees as his ERA is now only 2.70, but he was one of many Yankees who did not perform well on Thursday. The only run that the Yankees scored came off of a homer to right by Alex Rodriguez in the ninth inning. They were 0-4 with runners in scoring position and didn’t hit any extra-base hits besides that home run. The hits only came from the top of the lineup, which makes it difficult to score runs. Jacoby Ellsbury, Brett Gardner and Alex Rodriguez combined to go 5-11, but the rest of the lineup did not have a single hit in 19 at-bats. As a result of their three-game losing streak to the Rays, the Yankees now only have a one-game lead over Tampa Bay in the AL East. The Yankees will look to hit better and get back in the win column in Kansas City on Friday with Michael Pineda pitching. Pineda, who has a 2.72 ERA and 1.01 WHIP, is the ace of the rotation right now and recorded 16 strikeouts in his previous start, which is the second most in a single game by a righty in Yankees history. His 54 strikeouts are third in the American League and his five wins are also tied for second in the league. The Yankees (19-12) lost to the Baltimore Orioles (13-15), 6-2, on Saturday afternoon at Yankee Stadium. The win by the Orioles gave the Yankees a 2-1 edge in the series. The Yankees will look to win the series 3-1 on Sunday afternoon with Michael Pineda pitching. After allowing only one run in his first two starts combined, Chase Whitley gave up five earned runs in 5.2 innings pitched to the Orioles. He has allowed 14 runs in his four games pitched against the Orioles and in his 20 other games between last season and this season he has allowed 32 runs. This proves that he has struggled with the free-swinging powerful Orioles lineup. Whitely now has a solid 3.06 ERA and 1.19 WHIP. However, those numbers would be much better if not for Saturday’s start. He threw 97 pitches, but really only threw three pitches that hurt him besides hitting Steve Pearce with a changeup. Whitley started the game off pitching well as he struck out four of the first six batters he faced, but in the third inning Jimmy Paredes, who was in the trade that brought Lance Berkman to the Yankees, hit a solo homer to right. In the fourth inning, Chris Davis, who hit 53 homers in 2013, hit a bullet solo homer over the Playstation sign in right. Later in the inning, with Pearce on first, Alexandro De Aza hit his third homer of the season to give Baltimore a 4-0 lead. Delmon Young, who had a .362 average in 58 at-bats against the Yankees from 2012-2014, drove in the first of his two runs in the fifth inning. Whitley was taken out of the game after allowing a walk to Ryan Lavarnway with two outs in the sixth. In his first two starts this season Whitley had improved his changeup compared to last season. After the game Whitley said that there were only a few pitches that he would have wanted back, and those were the pitches that led to the Orioles getting the win. The Yankees also didn’t score enough runs to give them a chance. Wei-Yin Chen, who won his first game of the season even though he has a very good 2.52 ERA, had seven strikeouts and only allowed five hits and one run in seven innings. John Ryan Murphy hit a sacrifice fly to left that scored Chase Headley in the fifth inning to make the score 5-1. Headley made a few Gold Glove caliber plays at third base preventing more Baltimore scoring opportunities. He won a Gold Glove in 2012 and he could win another one the way he is playing defense. In the eighth inning, after Tommy Hunter came into the game in relief of Chen, Carlos Beltran hit a single up the middle to score Jacoby Ellsbury. Beltran was 1-4 and is average is only .194. The one positive sign for Beltran is that he has one or two hits in seven of his past nine games. Brett Gardner grounded out to first with runners on second and third in the ninth inning to end the game. Ellsbury scored a run, but his 0-5 performance ended his 11-game hitting streak. The Yankees will look to end the series on a positive note with their current ace of the staff (Pineda) pitching. They will play the Orioles at 1:05 p.m. and will honor mothers on Mother’s Day by using pink bats. The Yankees (16-10) lost to the Toronto Blue Jays, 3-1, at the Rogers Centre in the series opener. The Yankees swept the Boston Red Sox at Fenway Park in their previous three games and got yet another solid pitching performance but this time their offense didn’t produce. R.A. Dickey, who had an impressive 2.87 ERA in seven starts against the Yankees from the 2012 season through the 2014 season, only allowed one run and three hits in eight innings pitched. The Yankees have not had any success against the veteran knuckleballer and that continued on Monday night as he didn’t allow a hit in the first, third, fourth, fifth and eighth innings. Chase Headley had the team’s first hit of the game in the second inning. However, Garrett Jones’s ground out to shortstop stranded him at first. In the sixth inning the Yankees had runners on first and second with two outs, after a double by Jacoby Ellsbury and a walk by Brett Gardner, but Alex Rodriguez flied out to right to strand both runners. Rodriguez’s next homer will give him 561 and put him in sole possession of fourth place on the all-time homers list. He is currently tied for fourth with Willie Mays. The Yankees scored their only run in the seventh inning. Jones’s ground out to first scored Carlos Beltran after he had doubled and been advanced to third on Stephen Drew’s ground out to first. Beltran is now on a modest four-game hitting streak and is hitting more extra-base hits than he did earlier in the season. Four different players were 0-3 or 0-4 and the offensive’s ineptitude prevented Chase Whitley from getting his second win of his season in his second start. Whitely had six strikeouts, no walks and only allowed seven hits in his seven scoreless innings while only throwing 90 pitches. 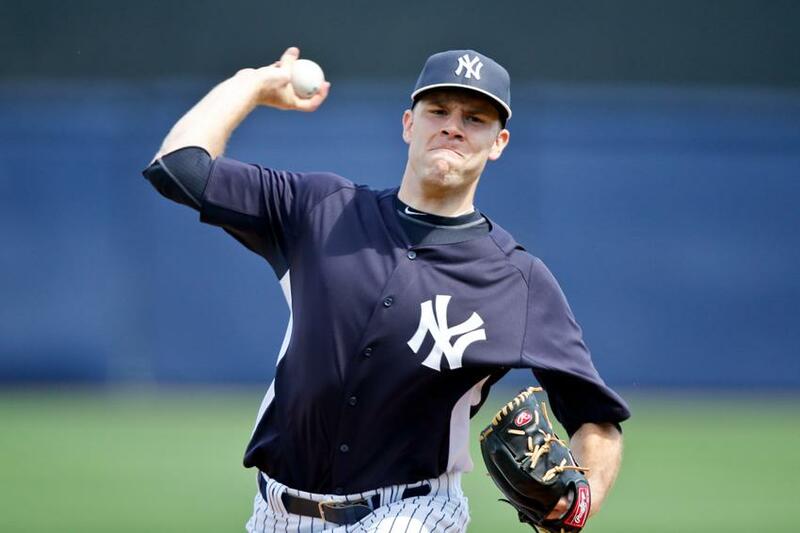 The Yankees could not have asked for a better performance from the 25-year-old right hander. It’s unfortunate that we didn’t score some runs to get Whitley the win,” Joe Girardi said. “His location has continued to improve as a starter. His strikeouts came in key spots.” His changeup has also improved from last year, which gives him another way to keep hitters off balance. It appears that Whitley will be a reliable fill-in while Masahiro Tanaka is on the disabled list. The Yankees had a 1-0 lead going into the bottom of the eighth but the bullpen, which has dominated this season and has rarely given up runs, allowed two earned runs and one unearned run in the eighth. Chris Marin came in to start the inning and allowed two consecutive singles after recording one out. Dellin Betances allowed a double to Edwin Encarnacion that scored Josh Donaldson but that run and the second run scored in the inning were both charged to Martin. The third run that Toronto scored was unearned because of a throwing error by Chase Headley. Russell Martin hit a hard grounder down the line that Headley made an outstanding play on and if Mark Teixeira was playing first instead of Jones he likely would have been able to catch the short hop. As a result of the error that was called on Headley, Betances still has a 0.00 ERA on the season. He has 26 strikeouts in his 15.1 innings pitched and has only walked two batters in his last 10 appearances after struggling with his control in the first week of the campaign. The Yankees will look to score more runs on Tuesday night when they will not be facing a knuckleball pitcher. The Yankees lost their final game before the All-Star break 3-1 to the Baltimore Orioles. The game was called in the fifth inning after a 2 hour and 22 minute rain delay at Camden Yards. They now have a 47-47 record and are five games behind the first place Orioles. 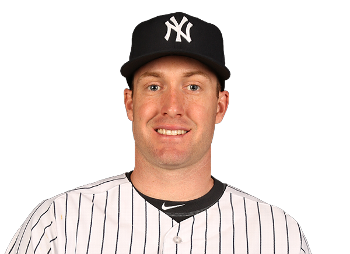 Chase Whitley, who was named the starter of Sunday’s game a few days after it was announced that Masahiro Tanaka would miss at lest six weeks as a result of a partially torn UCL, pitched 3.2 innings and allowed three earned runs on five hits. He allowed his three runs in the fourth inning. Chris Davis hit a two-run homer to left and and then Whitley was taken out of the game after Jonathan Schoop hit single that drove in J.J. Hardy. 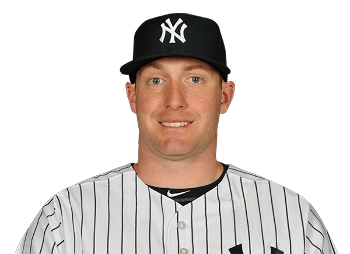 Whitley has now allowed three runs or more in his last four starts, and General Manager Brian Cashman will likely be looking to trade for a pitcher to replace Whitley in the next week. He pitched with surprising effectiveness in his five starts, where he allowed two runs or less in four of them, but he has not gotten the results recently because he has just recently converted from the bullpen to the rotation. The Yankees scored their only run of the game in the first inning off of a solo homer by Brett Gardner. It was Gardner’s ninth homer of the season, which is one more than he hit all of last season. The Yankees only had four hits in five innings, and besides Gardner’s homer, all of their hits were singles. The Yankees need Hiroki Kuroda, Shane Greene and David Phelps to continue to pitch well after the break, and for Brandon McCarthy to continue to allow a lot of ground balls like the did in his first start with the Yankees. Offensively, Carlos Beltran needs to come back from his concussion DL stint hitting well, and Brian McCann, Mark Teixeira and Jacoby Ellsbury need to be consistent and hit with power for the Yankees to make up ground in the division. 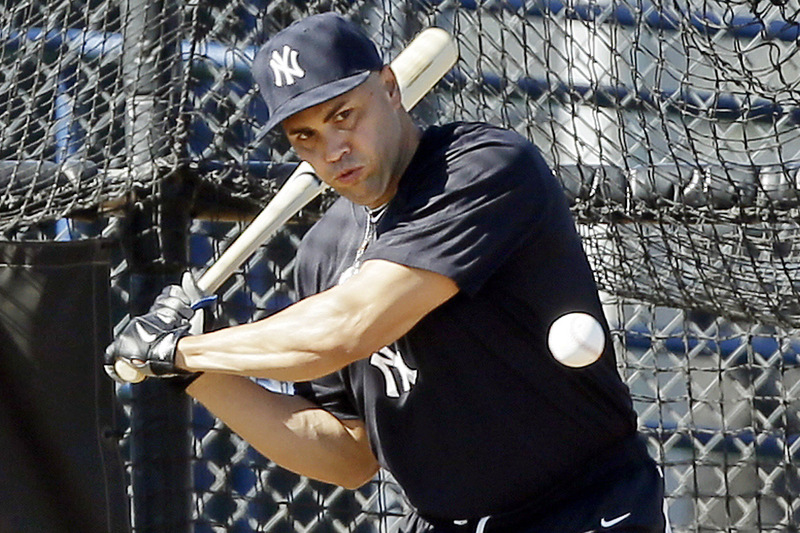 Carlos Beltran hitting during spring training. The Yankees lost to the Boston Red Sox 8-5 on Sunday Night Baseball in the Bronx. After winning eight of 10 games from June 10 to June 20, the Yankees have now lost six of their past eight games. They lost two out of three game that the Yankees played against the Red Sox over the weekend. Chase Whitley, who did not allow more than three runs in any of his first seven starts, has now allowed eight and five runs in his last two starts. This could be a sign of him wearing down because he had primarily been a reliever in his minor-league career before being called up to the Yankees earlier this season. On Sunday, he allowed eight hits, five runs and two walks against Boston. He is starting to lose the accuracy he showed in his previous starts because he has allowed five walks in his last two starts, but he only walked three batters in his first seven starts in the big leagues. In the second inning, Stephen Drew hit a single to right that scored Mike Napoli. In the third inning, David Ortiz hit his 450th home run of his career. He drove in Brock Holt and Dustin Pedroia to make the score 4-0 Red Sox. It makes sense that he set that milestone against the Yankees since he has hit so many homers against them during his career. For the first run of the game for the Yankees Derek Jeter drove in Ichiro Suzuki in the third inning. Ichiro was on third and Jeter hit his single on a 3-2 count with two outs. Mark Teixeira and Carlos Beltran both hit solo homers in the fourth inning to reduce Boston’s lead to 4-3. Teixeira hit his team-leading 15th homer and drove in his team-leading 41st RBI. Beltran led the team with his three hits, but it was not enough as the pitching could not contain the Red Sox offense. Beltran’s homer was his 366th of his borderline Hall of Fame career. He is in his 17th season after previously playing for the St. Louis Cardinals, San Francisco Giants, New York Mets, Houston Astros and Kansas City Royals. He is now tied with Lance Berkman for fourth place in the all-time homers list among switch hitters. In the fifth inning, with Shawn Kelley pitching after Whitley was taken out after allowing a walk to leadoff the inning, Pedroia hit a single to right that scored Jackie Bradley Jr. and Holt. Daniel Nava scored Boston’s seventh run as David Huff caught Pedroia stealing, which allowed Nava to score. The three Yankees pitchers that pitched in the fifth inning threw a combined 42 pitches. In the fifth inning the Yankees scored their fourth and fifth runs of the game. After Ichiro’s triple to lead off the inning, Brett Gardner hit a double to deep right to score Ichiro. After Jeter’s sacrifice ground out advanced Gardner to third, Jacoby Ellsbury’s ground out drove in Gardner. The Red Sox added an insurance run in the sixth off of Dellin Betances, but the run was charged to Huff. The Yankees will need to acquire a pitcher via trade in the next few weeks to replace Vidal Nuno or Chase Whitley in the rotation. CC Sabathia should be able to return around the All-Star Break. Sabathia allowed two runs on three hits in 2.1 innings for High-A Tampa on Saturday. His second rehab start is scheduled to take place on Thursday for Double-A Trenton. The Yankees are now two games behind the first place Toronto Blue Jays even though Toronto has lost their past three games. They will start a three game series against the Tampa Bay Rays on Monday night at 7:05 p.m. David Phelps, who only six runs in his last start, will pitch for the Yankees and Chris Archer (4-5) will get the start for the Rays. Chase Whitley pitching during spring training. 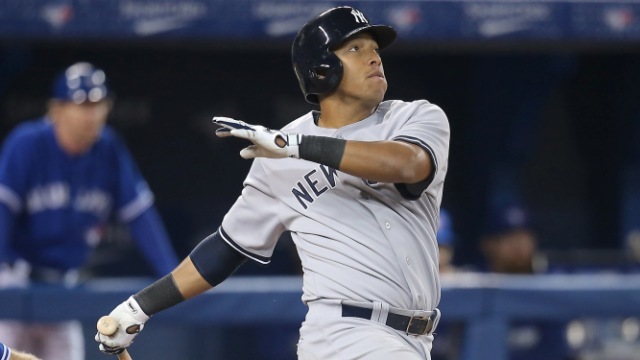 The Yankees lost to the Toronto Blue Jays 8-3 at the Rogers Centre on Monday. 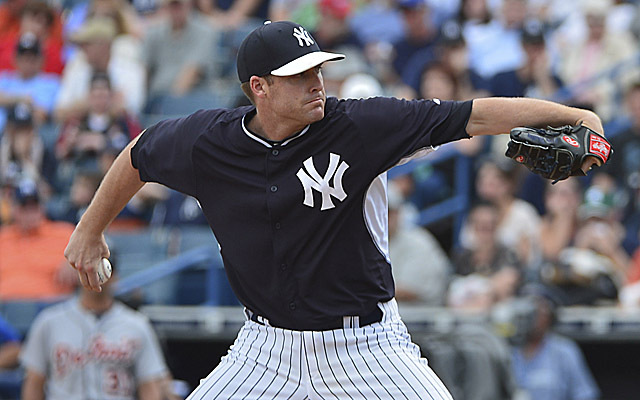 Chase Whitley‘s worst start of his career led to the third consecutive loss for the Yankees. Whitley, who had previously not allowed more than three runs in any of his seven starts, allowed eight earned runs in only 3.1 innings. It was expected that Whitley, who had only made 12 starts in his time in the minors before he was called up to fill in for CC Sabathia, would regress at some point, but it didn’t seem like he would allow eight runs in a start. He was not able to locate his pitches like in his previous starts. Whitley faced the Blue Jays in his last start and had a much better outcome. He only allowed two runs and five hits in five innings on June 18 at Yankee Stadium. This proves that the Blue Jays were able to adjust much better to him than he was to their offense. Marcus Stroman, a rookie from Long Island, who pitched against the Yankees last week at Yankee Stadium, pitched much better and lasted much longer than he did in his start last week. Stroman only lasted 3.2 innings on June 17, but held the Yankees to only one run in eight innings on Monday. The only run that the Yankees scored off of Stroman was Mark Teixeira’s 411-foot homer to center. The Yankees scored two runs off of Chad Jenkins in the ninth inning. Yangervis Solarte, who was hitless in his previous 27 at-bats after starting the year as one of the team’s best hitters, came in as a pinch hitter and hit a single that scored Francisco Cervelli. Another positive is that the bullpen did not allow a run in 4.2 innings pitched. David Huff, in a role that he was successful in last season, threw 3.2 one-hit innings. Shawn Kelley came in to pitch the ninth and struck out three and had his second consecutive solid outing after he allowed two runs against the Blue Jays last week. The offense, which has scored three runs or less in their previous three games (all losses), will look to bounce back against Tuesday’s starter, Mark Buehrle. He is off to an outstanding start to the season with a 2.32 ERA, but he has struggled in his career against the Yankees. 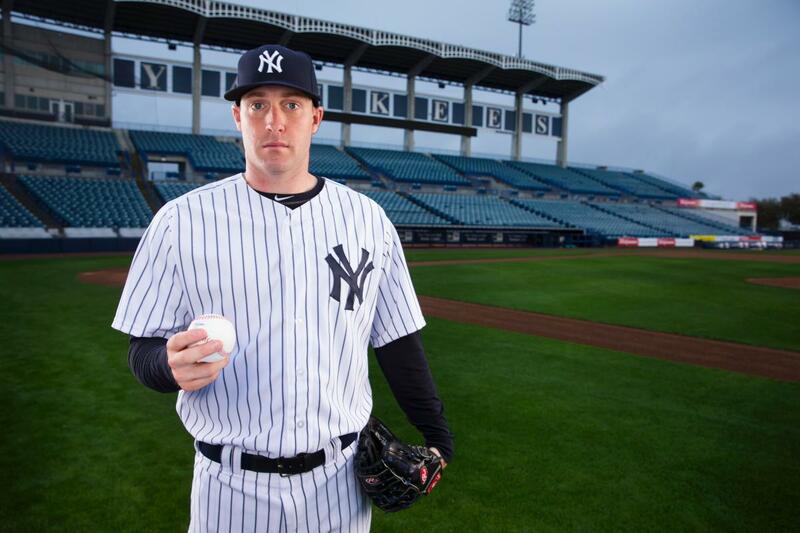 He had a 4.78 ERA against the Bronx Bombers from the 2011 to the 2013 season. The Yankees, who are now 5-5 in their last 10 games, are 2.5 games behind the Toronto Blue Jays for first place. David Phelps, who has won his last two games after allowing a combined two runs in those starts, will start his ninth game of the season. Tuesday’s middle game of the series will start at 7:07 p.m.
From the minors, first base/ right field / catcher prospect Peter O’Brien hit two homers in Monday’s game for the Trenton Thunder. Also, second base prospect Rob Refsnyder, who could get called up eventually to replace the struggling Brian Roberts, is hitting .311 in 45 at-bats since being promoted from Double-A Trenton. Yangervis Solarte hitting earlier this season. After sweeping their three-game series against the first place Toronto Blue Jays and winning the first game of the series against the Baltimore Orioles, the Yankees (39-35) lost the last two games against the Orioles to lose the series and fall into a tie for second place with the Baltimore. The Yankees offense, which scored five runs or more during their wins on Wednesday, Thursday and Friday, combined to score only one run over the weekend. They scored one run in the 6-1 loss on Saturday in which Vidal Nuno allowed three homers and his fifth in his last two starts. On Sunday, Masahiro Tanaka’s three runs in seven innings led to his 15th consecutive quality start to begin his career, but the Yankees lost 8-0 as the offense only had four hits. Yankees legends Yogi Berra and Whitey Ford were at Yankee Stadium for Old-Timers’ Day, as well first-time Old-Timers Hideki Matsui and Johnny Damon who helped the Yankees win their most recent World Series in 2009. However, their offense was not able to perform in front of them live up to their Bronx Bombers nickname as seven different players did not get a single hit. Brett Gardner and Jacoby Ellsbury each had a hit and a walk, and Ichiro Suzuki had two hits to improve his average to .314, but Derek Jeter grounded into a double play with runners on first and second with one out in the third and the Yankees as a whole were 0-5 with runners in scoring position. It is hard to win games when the offense has four hits and doesn’t come through at all with runners in scoring position. After hitting very well during his first month in the big leagues, Yangervis Solarte now does not have a hit in his last 27 at-bats and his average is now all the way down to .263. He led the team in many statistical categories including average and RBIs until the beginning of June. It seems like the Yankees should call up Rob Refsnyder from Triple-A Scranton if he continues to play well. Adam Warren, who has been a strength this season in the bullpen along with Dellin Betances and David Robertson, had his worst outing of the season as he allowed four runs in the eighth inning. His ERA skyrocketed from 2.04 to 2.88 after allowing two singles and an intentional walk, followed by a three-run double by J.J. Hardy and an RBI single by Manny Machado. David Huff allowed the Baltimore’s eighth run by allowing Caleb Joseph’s first career homer. The Yankees, who will start a three-game series against the Blue Jays in Toronto on Monday, will look to continue play well against the team that they are chasing. They have played three games in Toronto and three in the Bronx so far this season, and the Yankees have won five out of their first six games against the Blue Jays. Long Island’s Marcus Stroman will be pitching against the Yankees after allowing two runs, three walks and four hits in 3.2 innings in his start against the Yankees on June 17. Chase Whitley will try for his fourth consecutive win. He only allowed two runs and five hits in his win over the Blue Jays on June 18. He has 26 strikeouts and has remarkably only four walks in the 38.2 innings that he has pitched so far. Whitley, who was a relief pitcher for most of his professional career, has been better than the Yankees could have hoped for. Monday’s game at the Rogers Centre will start at 7:07 p.m.
From Charlie Hough to The Clevelander… a blog for the #DiehardFish fans living the #LinsLife!